What kind of skin care routine do you have? Would you say you are thoughtful about what is in your products? I started using a moisturizer on my face when I hit 30. Honestly, I probably should have started earlier, but finding something that sounded like it really helped was really hard. I ended up using something that smelled bad, cost a fortune and actually made my skin dry up more, rather than moisturize it! After looking into the ingredients that were in this product and the limited information about it's safety, I knew that I had to find something better. My whole family has been working on cutting out chemicals and using more eco-friendly and/or reusable products this year. We're using better laundry detergent, growing an organic garden, and trying to switch to healthier, more natural skin care products. Finding a product that would keep my skin nourished and looking good definitely was important too! I recently came across a business called Nora's Naturals here in Eastern Iowa that creates a variety of organic skin care and personal products. I was so excited to learn more about this business and Becky Hurst the WAHM (work at home mom) that started it all! Becky says she was motivated to begin her business when she experienced some health problems and traditional medicine was not helping her symptoms improve. She researched the ways she could reduce the toxins in her body, and that's when she decided to start making her own personal care products. "When I first started this business, it was meant to be a side "hobby" to help my own family and my friends and their families reduce their toxic loads. Around that same time that my business started growing, I got a new boss at my place of employment and he and I didn't mix well and I was becoming increasingly dissatisfied & unhappy there... after 2 years, my husband and I finally made the decision to have me quit and pursue Nora's Naturals full time (because it had become a full time job!). And now I am actually making a difference in people's lives (including being more present for my kids!). It's been a super spiritually strengthening experience." She says seeing and hearing the joy from her customers that have FINALLY found a good product that works well for them is really inspiring to her as a business owner. Also, being able to be flexible in her schedule to spend more quality time with her children is something she is very thankful for. I was sent the Nourishing Facial Oil and the Peppermint Lip Balm in exchange for a thorough, honest review. The Nourishing Facial Oil has so many wonderful 100% pure organic ingredients such as anti-aging argan oil and evening primrose oil, grapeseed oil, apricot kernal oil, rosehip, geranium, frankincense, meadowfoam seed, carrot seed essential oil, tamanu oil, baobab oil and others. It comes in a one ounce bottle with a treatment pump. The instructions are to shake well, then apply one pump of product to a freshly cleansed face and neck. You are to give it ample time to absorb (approximately 5 minutes) before applying anything else. The first time I tried it, I noticed it had such a pleasant, refreshing scent. Almost invigorating! I felt that it nurtured my skin and helped it bounce back to life. I don't have much time to add in to my personal care routine, but this product is super quick to put on, and makes your skin have that perfect glow! I have used this product for about a month now and I still have about half a container left. I think it's helped my skin find it's rhythm again, because after 3 kids my skin has been blotchy with a longer healing time. 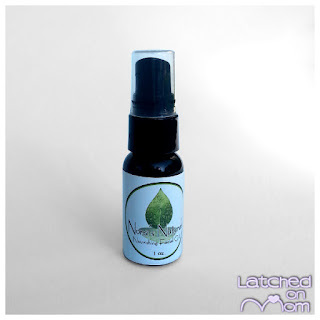 Since I've been using the Nourishing Facial Oil, the redness and spots seemed to have faded away. I am hopeful that this product will keep my skin nourished and that I may not have too many worry creases in my forehead when I become a grandma. I never used facial oils before, but I will never switch back to moisturizing creams, as long as I continue seeing these results from this product. 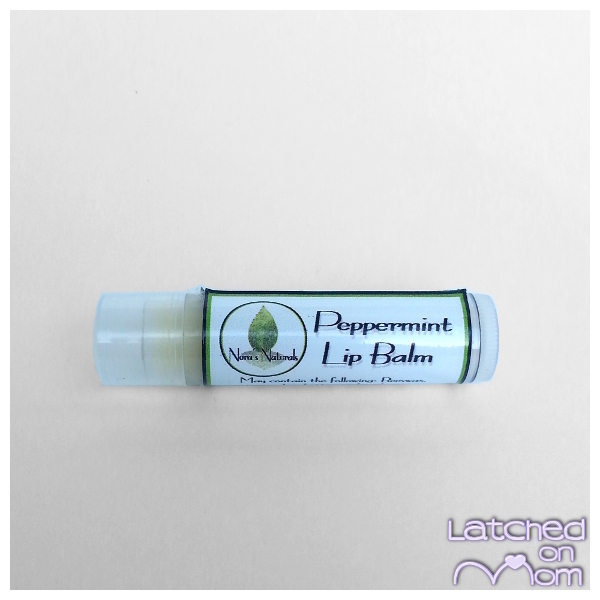 The Peppermint Lip Balm comes in a .15 ounce clear container. This particular blend contains beeswax, jojaba oil, apricot kernal oil, shea butter, vitamin E and essential oils. It is completely free of chemicals. The website says,"Lip protection and moisture last for a very long time." 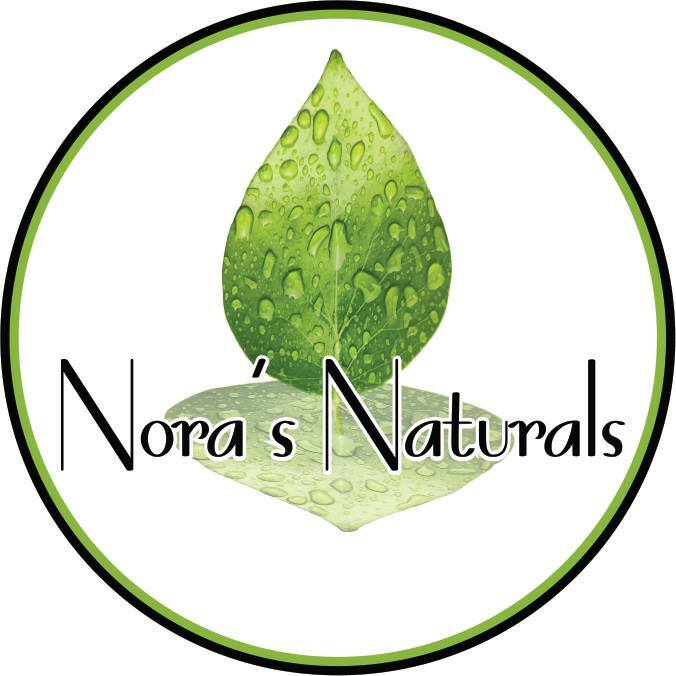 You can get Nora's Naturals Lip Balm in the following flavors: peppermint, orange clove, spearmint, lemongrass, citrus punch, rosemary mint, eucalyptus spearmint and The Four Thieves. I am not a big fan of peppermint, honestly, I don't really like it at all. However, this lip balm truly has a light note of it, definitely not overpowering whatsoever. 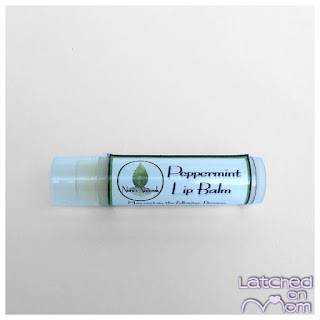 My lips felt much softer and silkier with this product, it surprised me how much I actually liked it! I'd absolutely recommend Nora's Naturals to anyone who wants to try a new, organic and healthier approach to facial treatments. What's my favorite thing about this product? It's organic and very affordable! Is there anything I'd change about it? No, I think it is simple and perfect. 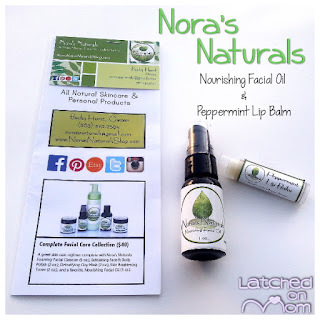 I give the Nourishing Facial Oil a 10/10 and the Peppermint Lip Balm a 9.5/10! If you're looking for special promotions and deals from Nora's Naturals, just LIKE the Facebook page, there's a GIVEAWAY happening right now! Click HERE to go check that out! 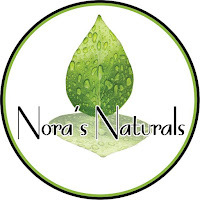 Don't forget to also follow @norasnaturals on Twitter!